There is no doubt that Australia’s franking system has lots of flaws. Today, we are one of the few countries in the world which maintains a franking system, and probably the only one that has cash rebates of franking. The Labor Party (the Federal Opposition) has now pushed franking into the spotlight but has chosen to do so with a highly questionable policy proposal. Its proposal hits many people in a harsh fashion while securing ongoing franking credit benefits for others. While the logic of the proposal is not obvious, there is an underlying reason for it and SMSF trustees need to be on red alert. The cessation of franking is not being proposed by the Labor Party. Indeed, their proposal acknowledges that after twenty years of cash rebates, franking is engrained in our taxation system. It is our view that the Labor proposal, unfortunately, is not well thought out nor is it properly structured and above all it is not fair! The Labor party is now proposing a crude hybrid approach - by clipping the edges of franking. It is crude because Labor wants to grandfather benefits for a certain part of the population while others would be stripped of benefits. Labor’s original proposal (of just 3 weeks ago) to scrap franking credit refunds that directly affected SMSFs and low-income earners was a poorly structured policy and is now acknowledged as such. It was produced after no public discussion and certainly no engagement with professionals who operate in the superannuation market. Regrettably, the new changes make the original proposal even worse and seem designed to punish some while cementing benefits to others. The amended proposal is unfair as it represents the arbitrary demarcation of benefits that flow to members of our society. The proposal is that a member of a SMSF whom is not receiving a Government pension before midnight on 27 March 2018 will never be able to claim a cash franking rebate in their SMSF. But a similar person whom has a SMSF and is also receiving a Government pension on 26 March 2018 (or before) can – and for the rest of their life! While the second person appears a winner, we suspect that the promise of grandfathering would not be one that could be relied upon for it depends upon the integrity of politicians and future governments. This policy is an unfortunate example of the frequent and unfair approach adopted by many Governments to arbitrarily and unfairly adjust legal benefits between members of society. Normally such changes are not done in retrospect, but the Labor Party has adopted a hybrid structure. If they form Government in 2019, then the law will change effective a year before they are elected. In this case, Labor’s policy would create sub-classes of “lucky” and “unlucky” Australians. An Australian will be “lucky” if they are entitled to a tax cash rebate and “unlucky” if they aren’t. No logic, no structure or concern with fairness – just a sledgehammer approach arbitrarily adopted - when it need not be. We question whether Labor considered or understands the effects on an Australian self-funded retiree if they fall on the wrong side of their arbitrary line in the sand. A retiree (after 27 March 2018) with the average $1.2 million pension fund (SMSF) who is denied any cash franking rebates will now need hundreds of thousands of dollars more in saved capital to generate the same return as they did before the change. Indeed the differential will worsen the longer they live. It appears that “baby boomers” with above average wealth are under general attack by Labor. Yet it is these people whom have saved to ensure that they do not claim a tax payer funded pension and for that they receive no recognition. Most concerning of all, is that the proposal is clearly an attack on SMSFs. It creates a two-tiered SMSF system which benefits some and discriminates against others for no logical reason. This policy to split SMSFs into pieces will make SMSFs a complicated area of financial services to advise upon and for trustees to manage. By putting that line in the sand, Labor will make the advice on managing and constructing an appropriate asset allocation for SMSFs unnecessarily difficult. Is Labor attempting to force retirees to give up managing their own super? It is time for the Labor Party to come clean with the Australian population and declare whether they support Australians saving and looking after themselves in retirement. Or is it Labor’s policy to force all Australians into industry funds? Once Labor opened the “franking can of worms” it suddenly came into focus that industry super funds are running their members’ funds with pension money and accumulation money pooled together. Pension members of pooled super funds may not have been aware that their franking credits on their share dividends have been utilised by accumulation members liable for the 15% superannuation tax. We can only guess at what tax credits and benefits have been dispersed from pension members to accumulation members. We can only guess as to how much tax has been lost by the government in this opaque structuring. It is important to understand that the transfer of franking credits from pension funds to accumulation funds can also reduce the contributions tax liability of pooled funds. Therefore the tax base that funds Commonwealth pensions is also decreased by this arrangement. As we will see below the industry Funds are really just tax effective savings funds and only super funds by name. This is because only a minority of their members will ever have enough super to retire comfortably. This makes the proposed Labor changes to SMSFs even more unfair, because SMSFs never have and never will have the ability to disperse taxation benefits between members inside their fund. Labor’s policy leaves the franking benefit offsets inside industry funds whilst attacking self-funded retirees. The declared policy to operate from 27 March 2018, if Labor is elected in 2019, will destabilise the SMSF industry to the benefit of the industry funds. The rejection of a “reasonable franking cash rebate” limit to be available to all investors, which has been presented by many super professionals - including ourselves in previous editions of the The View - is a stark example of this. Fair cash rebates can be maintained but seemingly the Labor Party sees this as specifically beneficial to SMSFs and against the interest of industry funds. Every change has a consequence, some intended, many unintended. Political parties need to propose policies that have both integrity and fairness as their core. The Labor policy on cash rebates of franking credits fails the fairness test. The following tables and charts, taken from the latest available ATO reports, disclose several interesting facts about SMSFs. To begin, as at 30 June 2017, there were approximately 600,000 funds with assets under management of approximately $700 billion. As these funds commonly have more than one member, the ATO estimates that there are 1.1 million Australians that are members of SMSFs. 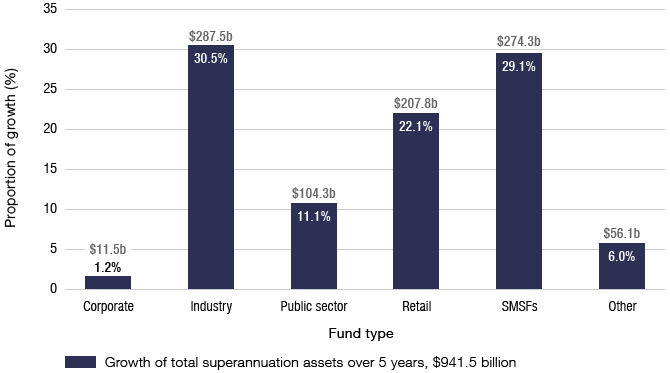 As at June 2017, SMSFs made up to 99.6% of superannuation funds by number and held 30% of all superannuation assets in Australia. Over the five years to 30 June 2017, growth in the number of SMSFs averaged almost 5% annually. 53% of SMSFs have been established for more than 10 years, and 16% have been established for three years or less. Over the last five years, the growth in SMSF assets has matched that of Industry Funds. Over one million Australians have decided that they should look after themselves in retirement and contrary to Labor’s claims, on average they are not massively wealthy people. The average SMSF member balance at 30 June 2016 was $599,000 and the median balance was $362,000, an increase of 26% and 32% respectively over the five years to 2016. The average member balances for female and male members were $511,000 and $641,000 respectively. It is a perverse outcome that the Labor Party’s proposal will hit females more harshly because they generally enter pension mode with lower balances than males. 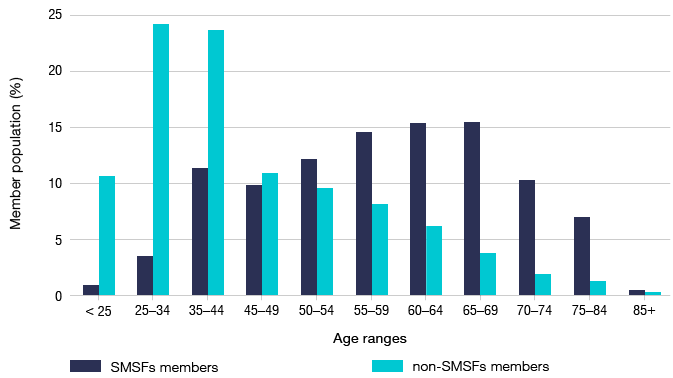 The chart below shows the average balances for SMSFs by age of members. It is to be expected that professional people that have saved/contributed for 30 years would have $1 million in their pension/super account. They could be compared with a member of the Commonwealth “non contributory pension scheme” (prior to 2005) who would have a tax payer funded indexed pension for life. The NPV of their pension stream would be millions of dollars more than the average balance of a self funded retiree (and that is an uncomfortable discussion that no one wants to have). The fact that the Future Fund is still $60 billion underfunded (even with $140 billion in assets) is an inconvenient truth for politicians. Over the five years to 2016, the proportion of members in SMSFs with balances of $200,000 or less decreased from 42% to 32% of all members. In 2016, most members had balances of between $200,001 and $1 million. Given their focus on saving for retirement, it can hardly be said that the average SMSF member is excessively rich – far from it. Further these trends are positive for SMSFs and society as they represent self-funded retirement outcomes. Of SMSFs established over the last 10 years to 2016, 70% have not yet started making pension payments. Therefore, the majority of SMSF members will be discriminated against by Labor’s policy. 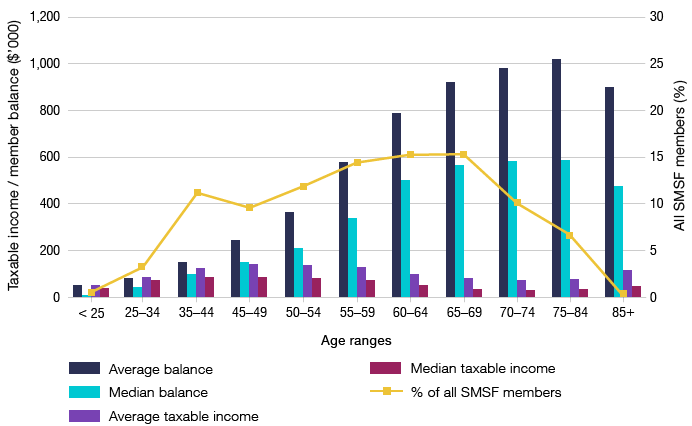 In total about 53% of all SMSFs are in accumulation stage and the lucky ones under Labor’s policy will be those 47% already in pension stage. 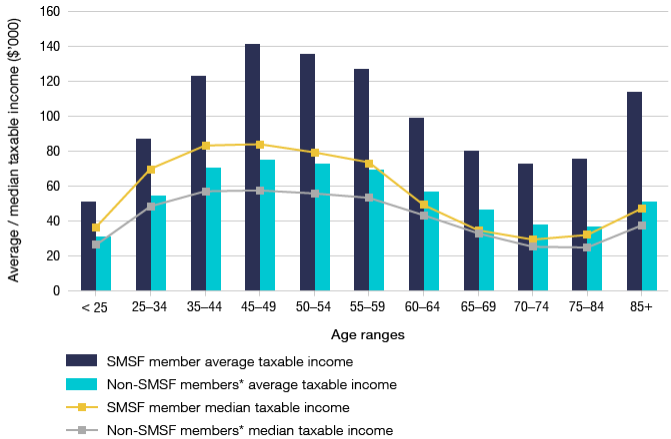 There is a clear and discernible trend for members of new SMSFs to be from younger age groups. The median age of SMSF members of newly established funds in 2016 was 47 years, compared to 59 years for all SMSF members as at 30 June 2017. As families move through their childhood stage, the school fees decline, the mortgage is paid off and HECS payments have finished, they naturally think of retirement. The SMSF structure gives these people control over their future and transparency over their assets. 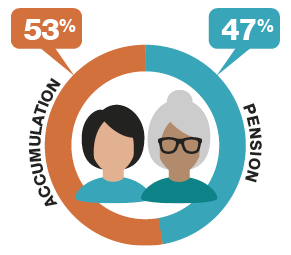 At 30 June 2017, 83% of SMSF members were 45 years or older. 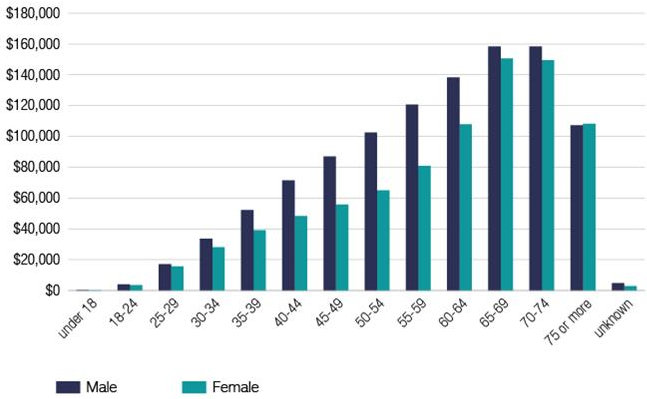 The average and median member age was 58 years and 59 years respectively. There were generally younger members in more recently established funds. 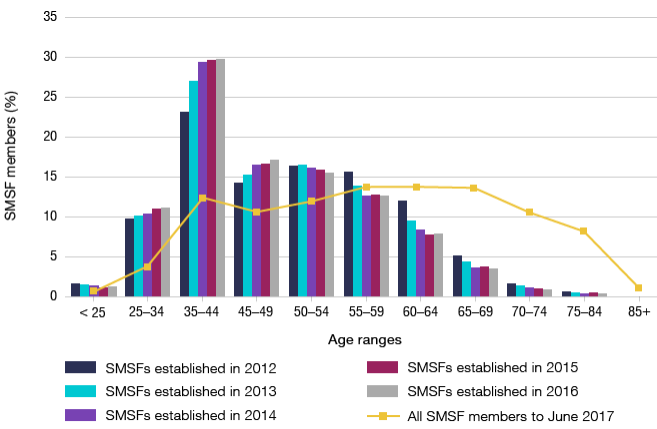 Of SMSFs established in 2016, 75% of members were under 55 years old, compared to 65% of members of SMSFs established in 2012. SMSFs are increasingly chosen by people that can look after themselves in retirement. The next table shows that the growth in members of both Industry and Retail funds are from those compelled to contribute to super at a young age. As people mature and have more savings, they tend to move to self-managed or directed schemes (if they can). The sharp decline in “pension stage” members (over 60 years old) in non-SMSFs shows that member balances in Industry Funds are generally inadequate to meet the pension requirements of their members. It is an indictment of Australia’s superannuation system that over 75% of retirees still claim a full or part pension in retirement. Industry and retail funds generally manage funds for people that will never have enough to fund a secure or comfortable retirement, and the Labor policy seems designed to drive more people into this category. The glossy advertisements of industry funds that portray retirement freedom for their members are far from reality. Indeed, for most retiring females their financial position is diabolical – more so if they are single. 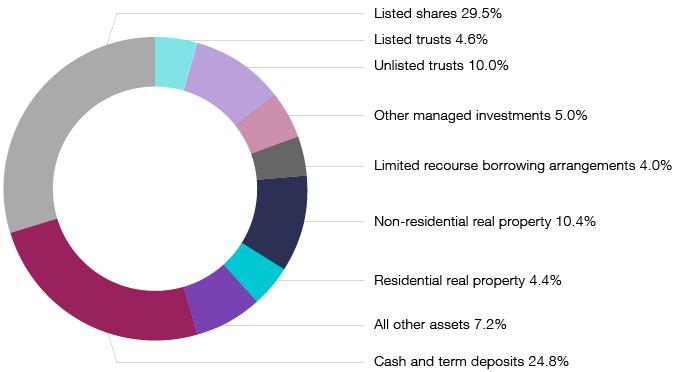 The latest available asset allocation statistics from 2016 show that Australian shares were not excessively held inside SMSFs. Thus while the benefits of franking cash credits are real, they are not excessively exploited or abused by the majority of SMSFs. The Labor party has manipulated the franking rebates utilised by a very small minority to justify their policy. For most SMSFs in pension mode, the payment of pensions is not excessive and does not suggest that the super-rich dominate this category. In 2016 the average benefit payment was $127,000, and the median payment $62,700. Our observation is that SMSFs in pension mode are working for those that utilise them. In 2016, the main type of income stream benefit payment was for members 60 years and older. The average benefit payment per member increased each year, from $66,000 in 2012 to $76,000 in 2016. However, benefit payments as a proportion of the average member balance remained steady over the same period, at approximately 8% of the average member balance. 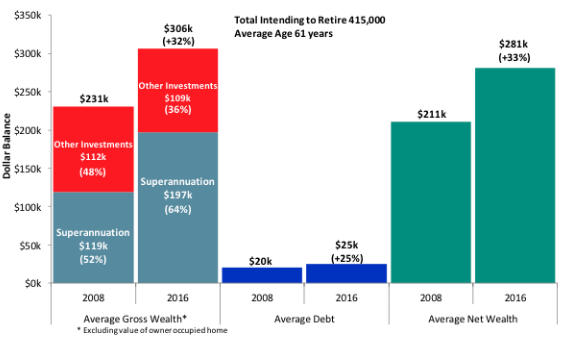 The final chart is a snapshot of the position for the average Australian retiring in 2016. With just $197k in superannuation, the average retiree is hopelessly underfunded and thus a long-term burden on the Australian tax payer. For many, a better option or solution (which does not currently exist) than the forced contribution to an Industry or Retail Fund would be a contribution to a national pension scheme into which everyone contributes. In that instance, the self-managed pension schemes have a legitimate role for people that can and should add to their pension entitlements. In that case, the Government would have to decide what would be a fair balance or a reasonable asset size to supplement a national pension scheme. The current debate and the national superannuation scheme is a long way from this and there is no solution in sight. The Labor policy does not even attempt to address the fundamental problem. An SMSF is a rich man's vehicle ???? This is not surprising as the Labor party has always been intent on group politics and disliking the individual. They have always tried to disguise this fundamental dogma in spin and incredibly badly crafted financial legislation. Its called envy politics. So be it.... as people clearly vote for this policy as they have done in the past. The Liberals have also become incredibly weak on financial policy which impacts us all. Both party capitalise on envy politics and sentiment and the general media always openly supports this as you rarely meet a rich journalist. Sad to say, I'm past being surprised by the poor legislation debated in today's world as all politics is now based on emotion rather than practical outcomes.